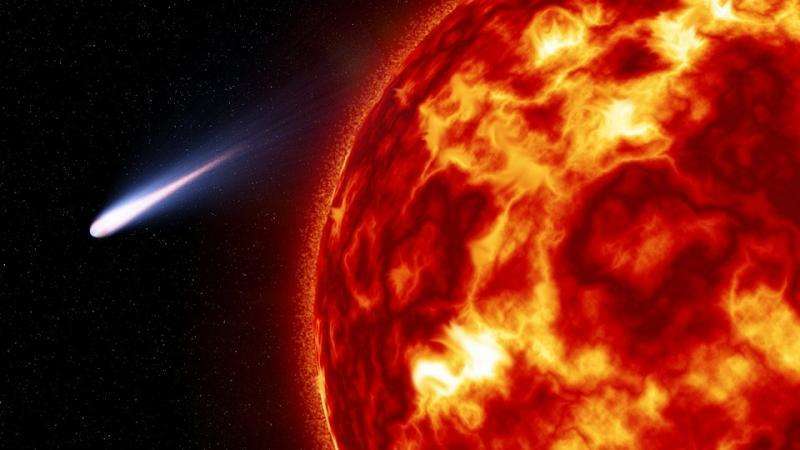 Scientists have revealed that some of Earth's atmosphere may have been brought to the planet by comets billions of years ago. The mystery of how the Earth's atmosphere was formed has long baffled scientists. Some researchers think comets might have originally brought some of the water, organic and atmospheric molecules to Earth that now make up its life. Now a new study, published in Nature Communications, by researchers from The University of Manchester, UK, Centre de Recherches Pétrographiques et Géochimiques (CRPG) and Université de Lorraine (Nancy, France), has found evidence to back up the theory. The scientists have been analysing tiny samples of ancient air trapped in water bubbles found in the mineral, quartz, which dates back more than three billion years. The team found that the air in the rocks is partly made up of an extremely rare form of the chemical element, xenon. It is known as U-Xe and what makes it so rare is that it isn't usually found on Earth. The component is not present in the Earth's mantle, nor is it found in meteorites. Therefore, the team believe that the U-Xe must have been added to the Earth after a primordial atmosphere had developed. Simply put, comets are the best candidates for carrying the U-Xe to the planet. Co-author, Prof Ray Burgess, from Manchester's School of Earth and Environmental Sciences explains: "The Earth formed too close to the Sun for volatile elements, such as U-Xe, to easily condense and they would have rapidly boiled off the surface and been lost to space. "The reason that oceans and an atmosphere exist at all is because volatiles were still being added after the Earth formed. The puzzle is in identifying where the volatiles came from and what objects carried them to the early Earth. "The difficulty is that many of the different volatile ingredients that were originally added have been thoroughly mixed together by geological processes during Earth's long geological history." To combat this 'mixing' issue the team used tiny samples of ancient air trapped in water bubbles found in quartz in drill cores from the Barberton area of South Africa. The rocks from this region of the continent are extremely old and very well preserved. The team found that, in the Barberton quartz, 3.3 billion year old U-Xe has a composition very different from the xenon found in the Earth's atmosphere today. Lead author Dr Guillaume Avice from CRPG, said: "We measured the amount and isotopic abundance of xenon in the 3.3 billion year old air with unparalleled precision. "Xenon is a noble gas which, being chemically inert and having nine isotopes, is an ideal element to reveal the xenon isotopic composition in the Earth's primary atmosphere. This also makes it an ideal way of finding out where the atmosphere came from." Prof Bernard Marty, who initiated the study and who is also based as CRPG, said: "Our study reveals that 3 billion years ago there was already a xenon component in the Earth's atmosphere different from solar gases and in asteroids. One possibility is that this xenon was from comets." But the discovery also shows the research possibilities of studying gases found trapped deep in the earth. Dr Avice added: "The study of gases trapped in ancient rocks opens new perspectives in our understanding of the origin and evolution of Earth's volatile elements which are key factors for our planet's habitability." How did early Earth protect itself against the cold?